The deeply dissected foliage of Acer palmatum 'Emerald Lace' bursts into life in spring with its bright, lime green colouring. As summer approaches, the leaves become edged with red for a striking contrast. Finally, in autumn the foliage takes on a red-orange hue before falling to the ground. With such vibrant seasonal interest, this Laceleaf Japanese Maple is the perfect small garden tree. 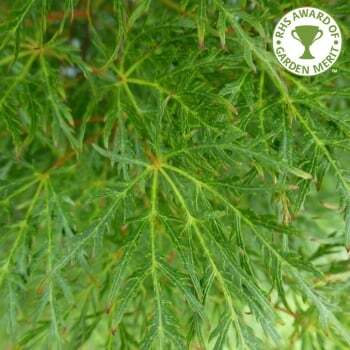 Acer palmatum dissectum 'Emerald Lace' has a final height of 3 x 2 metres and a compact habit. The softly rounded crown is made up of elegantly arching branches and moves gracefully in the breeze. Emerald Lace can be planted in the ground, but equally it will grow well in a large container and make a wonderful patio tree, as long as it is watered and fed generously. We have wonderful mature specimens of Japanese Maple Emerald Lace available, as well as smaller options. Pot grown Emerald Lace Japanese Maples can be planted at any time of the year. Firstly, remove all weeds and grass within a metre of your desired planting hole then dig a square hole as deep as your root mass and approximately 2x as wide. To help your tree establish more effectively, we advise sprinkling root grow in the hole, especially if you have poor soil.